I may be walking on “thin ice” but when I read “look at the stone quarry from which you were dug,” I immediately I thought of Jesus reaching back into his empty tomb and pulling us out one at a time. Our lives are built on the solid rock we know as Jesus and God PROMISES us when we trust in Him we will NEVER be disappointed! For some of us (including me) those two emphasized words are a stumbling block yet at the same they are prophetic. In my own experiences there have been and are times when I don’t believe them yet when things begin to turn sour I withdraw into myself, yet not far enough to discover the Tested Rock deep in my heart. Yet the Holy Spirit does not let me drift far when suddenly the Light comes on and the words become prophetic and I make the jump from unbelief to belief. Those two verses from chapters 28 and 51 are verses of Hope, verses to build our lives on! I remember gazing and marveling at the size of Rock of Gibraltar as the USS Newman K. Perry steamed out of the Mediterranean Sea and into the Atlantic Ocean headed home. 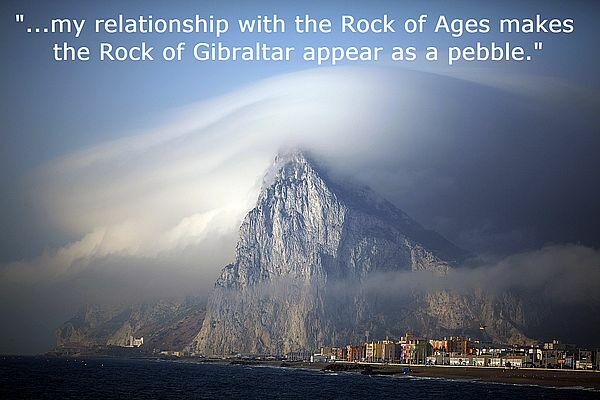 Now when I think about my life and the uncountable blessing that have come from my relationship with the Rock of Ages makes the Rock of Gibraltar appear as a pebble.